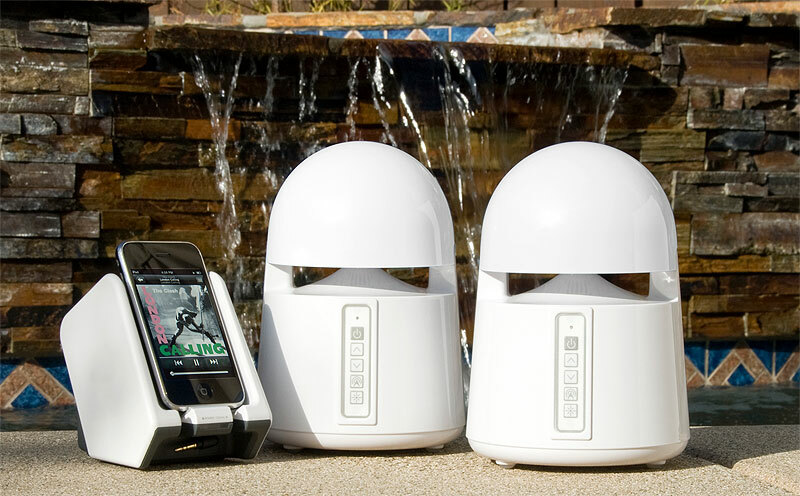 Having wireless outdoor speakers at your pool, deck and patio areas can greatly enhance your outdoor experience. As you swim by the pool or party with your friends, your guests can enjoy their favorite soundtracks while controlling these outdoor speakers from their Bluetooth devices. Some of these wireless outdoor speakers are portable too, making them suitable for camping or for use on the beach or even on a boat ride with their all-weather resistant design. Here are the top 10 wireless outdoor speakers that stand out for their quality material construction and stellar audio performance, producing full and rich sound in outdoor spaces while connecting seamlessly to our Bluetooth devices at long range. 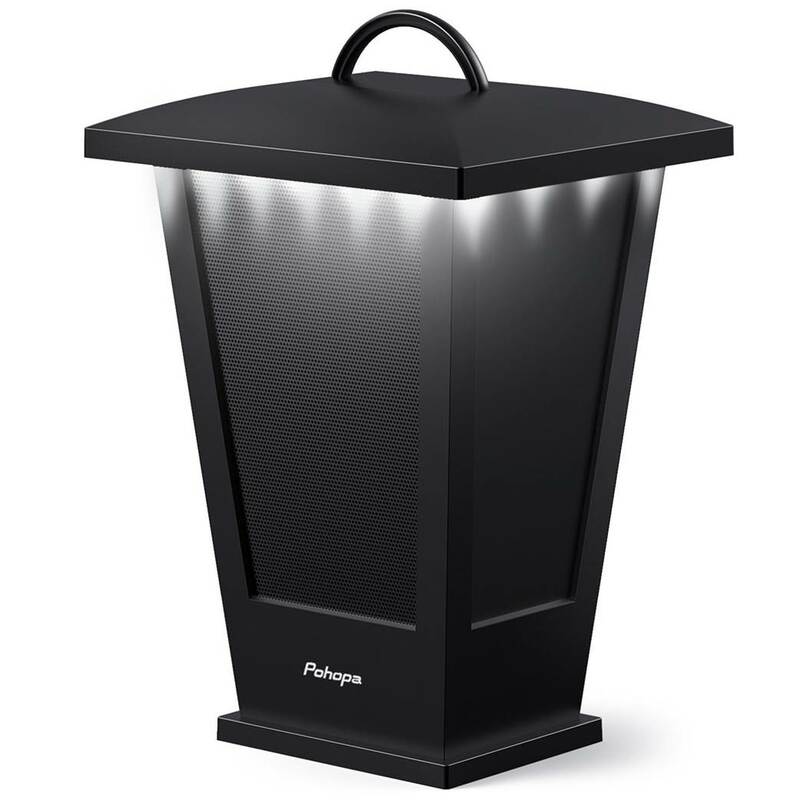 The Pohopa is one of the best wireless outdoor speakers you can find that delivers 10W of solid sound performance with a unique lantern design and LED lighting. 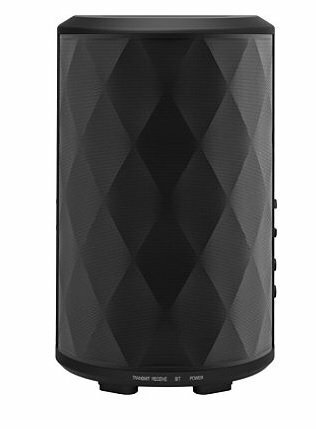 This wireless speaker is IPX4 waterproof rated and comes with a built-in 4400 mAh battery that delivers up to 8 hours of continuous music playtime outdoors, or 4 hours of solid sound performance at full volume. The speaker features a very unique lantern design that looks really sleek and modern – it also has bright LED lights which lights up during night time use and enhances the overall mood for the party. 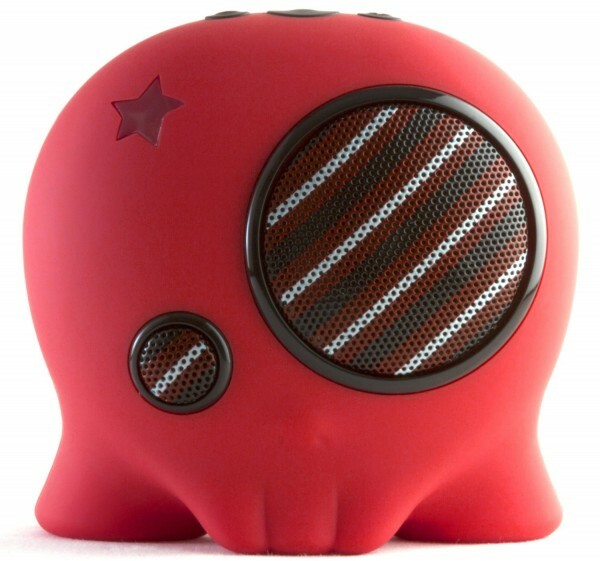 The Pohopa speaker is equipped with Bluetooth 4.1 for consistent and strong wireless music streaming. It also comes with acoustic drivers that can pump out a good 10Ws of full-bodied stereo sound with crisp highs and good bass response from a subwoofer; it has a unique loudspeaker cavity structure to deliver premium acoustic sound performance. We also liked the fact that you can pair two of these speakers together to create a true stereo soundstage with a combined 20Ws of power. The speaker is compatible with most Bluetooth devices and also connects to non-wireless music sources via a 3.5mm audio input jack. It is the ideal set of wireless outdoor speakers to take along with you for outdoor barbecues or gatherings and comes highly recommended. 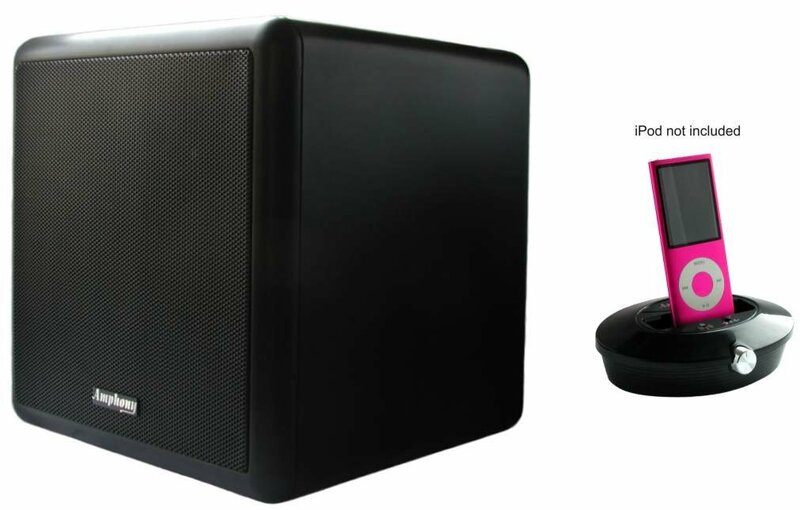 The sound performance of the Pohopa speaker is clear, detailed and solid. The speaker is capable of producing 10W of full-bodied sound with very crisp highs, good midrange performance and bass response. Music performances from the B210D speaker sounded very well-defined with great attention to detail and with decent soundstage. The speaker has pretty good bass response and emphasizes the lower-midrange frequencies pretty clearly – bass heavy music genres such as electronic dance music and rock music sounded very punchy right off the bat. Vocal performances were delivered sharp and crystal clear, while instrumental notes were naturally reproduced without any hint of coloration. The speaker is designed to deliver sound outdoors and you can really crank up the volume on the speaker without hearing any to very little distortion. We liked the fact that you can actually link up multiple speakers together to create a much wider stereo soundstage directly from your mobile device – the music is synchronized and is perfect if you need wider sound coverage in outdoor open spaces. The Pohopa B210D speaker really shines in terms of design – the speaker has LED lights in a unique lantern that looks very sleek and stunning. The LED lights are bright and sleek which adds a unique touch to the mood while listening to music outdoors. The speaker has a pretty large battery capacity of 4400mAh which can support up to 8 hours of continuous music playtime at 50% volume – the battery capacity also depends on whether the LED lights are switched on. The rechargeable lithium battery recharges via the included micro USB cable. The B210 wireless outdoor speaker supports Bluetooth 4.1 music streaming for a consistent and stable connection, and also supports 3.5mm audio input from non-wireless music sources. 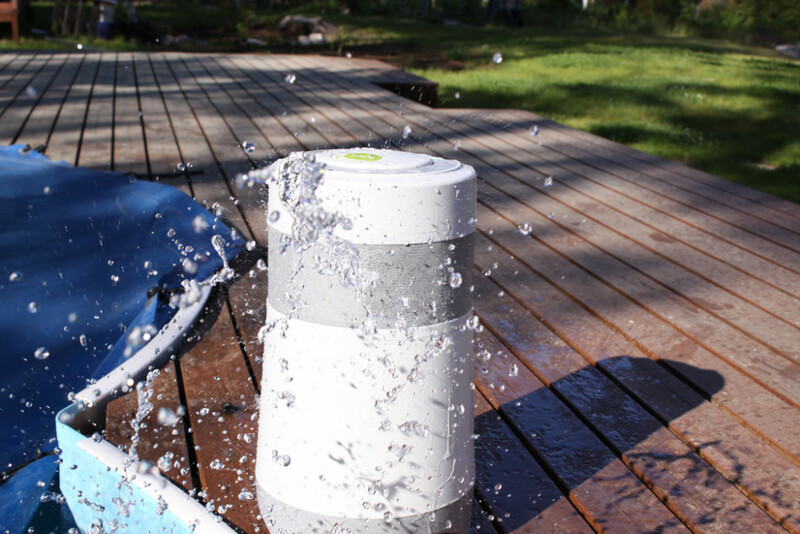 The speaker has a pretty solid and durable design with an IPX4 water-resistant framework; it is also dustproof and perfect for backyard, lawn, patio or camping trips. The speaker itself is very portable and weighs a mere 2.27 lbs, which makes it easy to carry around. The Verdict? The Pohopa B210D is one of the few wireless outdoor speakers that truly packs a punch with 10Ws of solid sound performance, 4400mAh of battery life and a stunning LED design. It features a unique lantern shaped design that looks really sleek and is portable and lightweight, weighing a mere 2.27 lbs. 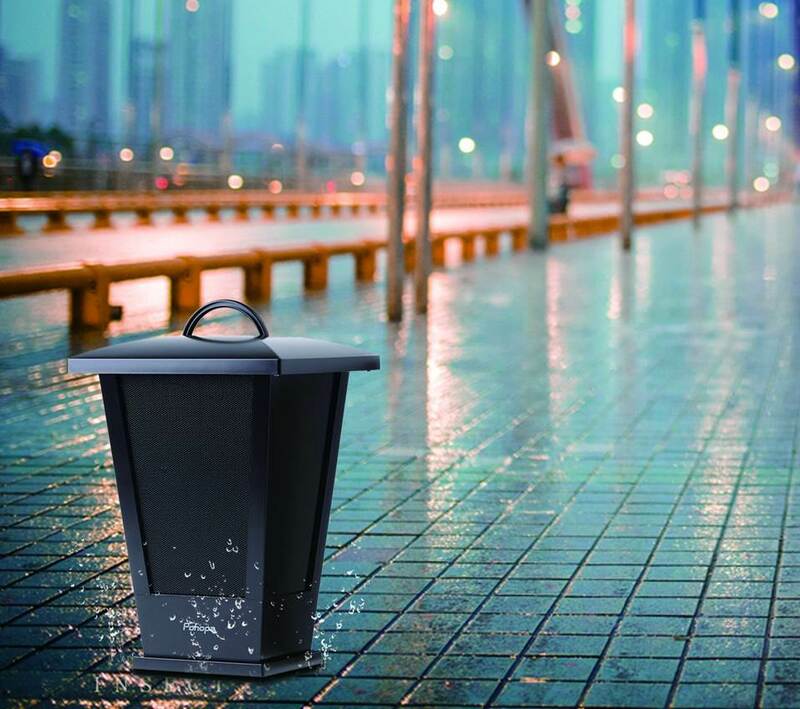 The speaker is also IPX4 water-resistant and dustproof which provides some degree of protection from rain and outdoor elements. The sound performance on this speaker is solid and crisp, with very detailed highs, good midranges and deep bass performance. Vocal performances sounded sharp and clean, while instrumental notes were well-defined. The speaker has enough volume for a small outdoor gathering – you can also pair multiple speakers together and stream music from a single mobile device for a much wider stereo soundstage. The speaker also has Bluetooth 4.1 with a range of 33 feet for wireless music streaming. Overall, it is a really solid set of wireless outdoor speakers that delivers great sound performance and comes highly recommended. The Acoustic Research Wireless Outdoor Speaker is a very sleek and modern looking lantern shaped speaker that delivers high-quality, full rich sound in the outdoors. The sleek, stylish design of the speaker is super eye-catching, and blends in well with home interior décor too. This speaker system gives you the option to directly connect your portable devices, or listen wirelessly with the included transmitter that allows you to listen to your music or TV from up to 150 feet away. Furthermore, the weather resistant features and solid construction allows you to bring it outdoors without having to worry about them. In terms of design, these speakers are hands down one of the most unique and modern looking wireless outdoor speakers out there in the market. The Acoustic Research brings a lot of functionality into a single lantern shaped speaker and its corresponding transmitter. You can add multiple units wirelessly to the transmitter to expand your listening environment, which means that you can have multiple units positioned separately and control them from a single iPhone or Android. Furthermore, you can also select 3 broadcast frequencies for the best possible reception. This speaker is powered by 6 AA batteries (not included in the package) and lasts a total of 12 hours of playtime when fully charged. It also includes an AC/DC power adaptor and AUX input for other wired sources. In terms of sound, the volume on the Acoustic Research can go relatively high without any distortions and the speakers produce crisp and clear sound. We even had to turn down the volume on these at one point. The sound quality is decent for a speaker of this size, and we felt that it had more of an emphasis on the highs and mids rather than the low-end, although this is understandable due to its compact size. The bass was decent and punchy, although we felt it could have been more accentuated. The transmission with these wireless outdoor speakers is very good; the sound is not disturbed by people walking between the transmitter and receiver, or by wifi or other electronics. We tested this speaker for about 2 weeks and felt that it worked perfectly well outside on the patio (where you can plug it in), or take in around the yard (using battery). 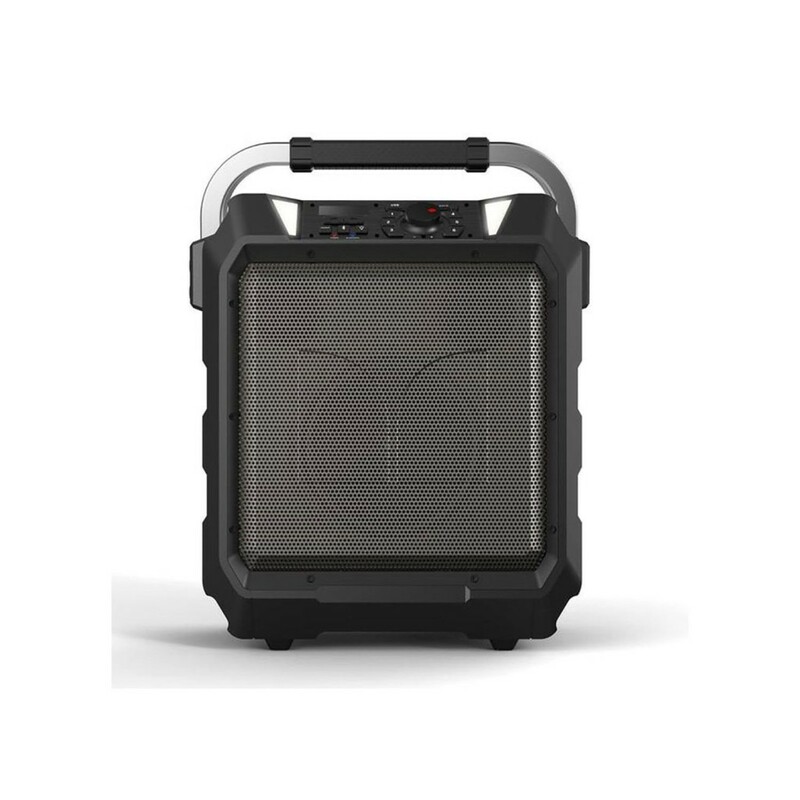 It’s a very lightweight speaker which makes it very portable for outdoor use. The Verdict? The Acoustic Research is a very good wireless outdoor speaker, especially for the value. The transmitter allows you to enjoy music wirelessly from 150 feet away, and the advanced Bluetooth technology allows you to connect easily with any Bluetooth device to stream your favorite soundtracks. The sound on these speakers are nice and solid; and go very loud for its size. It’s water-resistant design, portability and sleek and unique lantern shape makes this one of the best wireless outdoor speakers you can find at the moment. Furthermore, these speakers are now selling at a very good price at the time of writing so don’t forget to check them out! The Russound AGO1 is an impressive wireless outdoor speaker with top notch quality construction which takes not time to set up at all. The sound is incredible at any volume too. We found that the sound fills the yard with sound or provides great background music at low volumes. Due to its weatherproof construction, you can also leave it outside (but not for extended periods of time). Furthermore, the setup of this wireless outdoor speaker is as simple as it gets – simply install the airport express into the back of the speaker, turn the speaker on and let the airport express register itself on the network (assuming you already gone through the airport set up), select the AirGo speaker in iTunes or your iPhone or iPad, and sit back and enjoy the rich, full sounds. The set up took around 30 seconds and the concept is hands down awesome. To put it simply, we were simply blown away by the sound generated from this wireless outdoor speaker. The highs and low responses were very good. 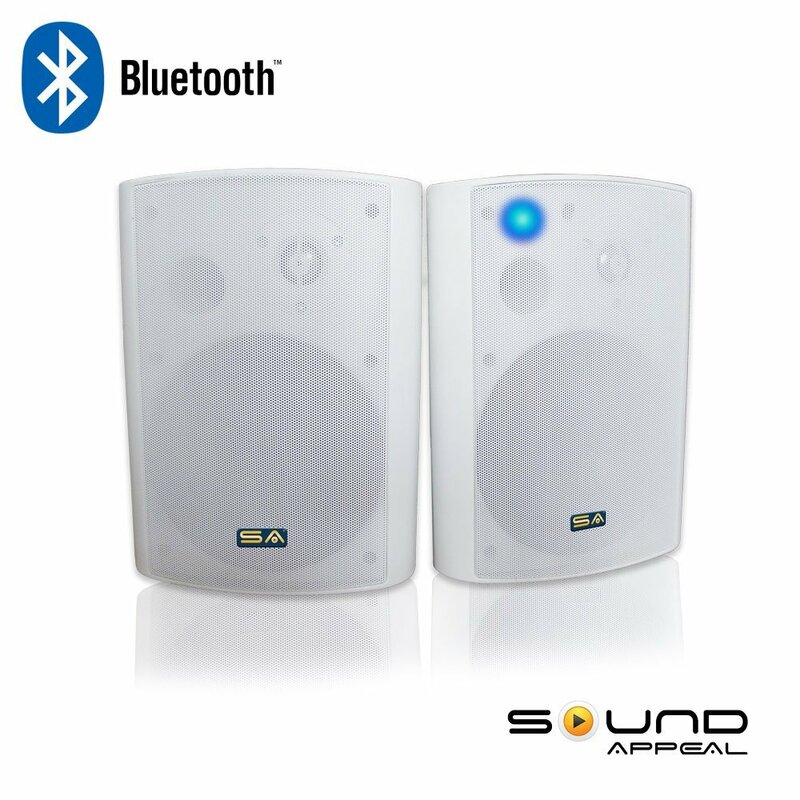 The single large stereo speaker provided excellent sound quality and a wide sound stage. You could place it on the deck near the house of to cover the deck and backyard with music while having a cookout, on the driveway near the garage when washing the car, or at the beach for a relaxing chill. We cannot image there being a rival in its class and certainly not with the capability to pair it with an Airport Express for such an elegant solution. Because of their portability you could also transport these speakers anywhere with much ease; although we caution leaving these speakers in the outdoors for extended periods of time and exposed to the elements. The only drawback we found with these is that you must use the Airport Express for wireless connection so that’s that extra purchase. Additionally, there is no volume capability on the outdoor speaker itself so you have to use the volume setting on the airplay device you are using. Other than that, we found this wireless outdoor speaker to function perfectly as intended. The Verdict? The Russound AGO1 is exactly what you need set up ready to use on the spur of the moment with no fuss. It is one of the most convenient wireless outdoor speakers in the market at this price range and it gives a very good wifi range and has plenty of power in its output sound. This incredible wireless outdoor speaker is now selling at a very good price at the time of writing, so don’t forget to check it out! The Monster Rockin’ Roller is one of the best wireless outdoor speakers we’ve ever encountered. Whether you’re camping, on the jobsite, or just working in the yard this little beast is one of the best speakers you will ever have. It packs a deep punch with 80 watts of omni-directional source for robust sound quality. The sound can go really loud which is incredible for a speaker of this size. We really like the bass that this Monster speaker produces and it also has a good balance of treble too. The highs and mids are crisp and clear and there is no distortion at high volumes. In terms of sound, you can’t really go wrong with these wireless outdoor speakers. We really liked the additional functionality that came with the Monster speakers. The buttons are all LED powered for easy viewing at night and the extra outlets and two USB chargers are awesome, although you need to plug the unit into the power source for them to charge. The battery life on the Monster is incredible – we tested it via USB connection to our iphone and run full blast for 36 hours and it still had four “bars’ of battery remaining. The rugged construction of the Monster speaker makes it water resistant too. The rolling wheels are really nice and rugged, and it is light enough to be carried upstairs or up ridges. The Aux input for additional audio sources is a nice added touch. Furthermore, it also has an FM radio feature which is nice and clear. Our thoughts are that the Monster Rockin’ Roller is great for any thing you do outside. We have used it on the beach, in the back yard and even connected the laptop for late night moves in the garden. The only down side we have found is that it had issues at the beach by the sand dunes picking up a signal for FM. Once we moved closer to the water no issues picking up signal. Sand and humidity did not affect the system with the rubber stoppers in place. The Verdict? We were super impressed with the Monster and this is definitely one of the best wireless outdoor speakers at this price range. The sound of these outdoor speakers was awesome and the bluetooth was easy to connect; the extra-long lasting battery life is an added plus too. Overall, it’s one durable speaker that will definitely last for a long time with an outstanding audio performance. The Soundcast is one of the best wireless outdoor speakers we have ever come across. We tested this with the amplifier to stream Pandora to the speaker which is roughly 200’ outside. The speaker provides excellent sound in e a huge radius, filling the backyard pool area with great sound. We were surprised at how good this speaker sounds considering its size. It has a tons of bass, and the mids and high ends sounded great too. Furthermore, this works great with the Soundcast Wireless transmitter if you want to send whatever music that is playing on your home stereo to the outside. The Soundcast is weather-resistant and wireless, and is designed to let you enjoy omni-directional sound throughout your house or outdoor environments. It features a 6-1/2” downward firing woofer and four 3” high frequency drivers in an omni-directional array, which allows it to project bass you can feel and high range notes with clarity normally heard only in high-end stereo equipment. The 60-watt multi-channel amplifier worked extremely well too – the sound was loud enough for outdoor use to fill the entire backyard, and yet produced no distortions whatsoever. 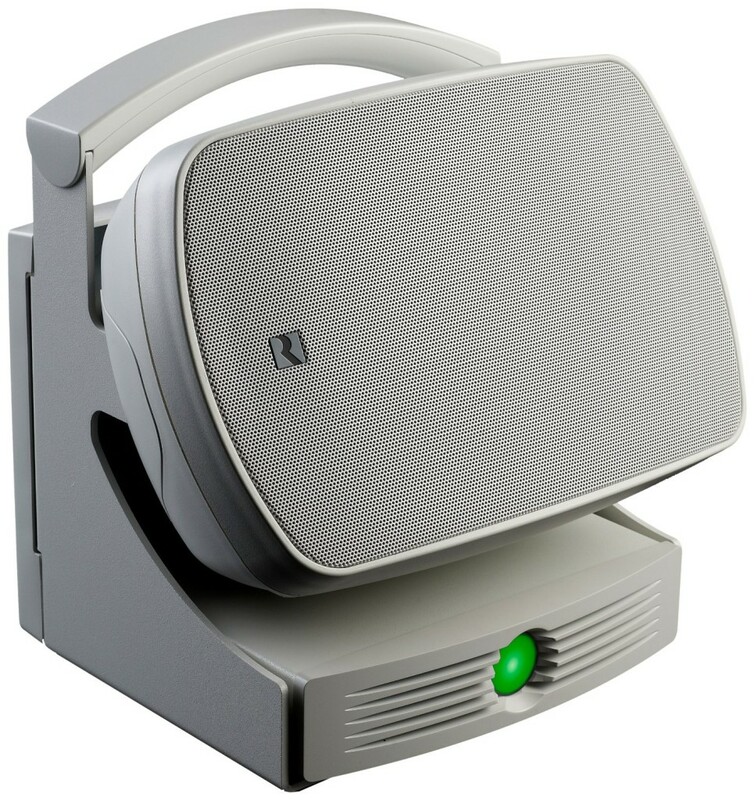 The unique thing about Soundcast is that they allow you to customize the coordination of transmitters and receivers, with this speaker being one of the multiple receiver options within the SoundCast system. The transmitters include the iCast transmitter for iPod/iPhone transmission and the Universal Audio Transmitter (UAT) for computer and other mp3 audio transmission. This is pretty useful if you want to stream your music from different devices from your home to the outdoors without any wiring. The SoundCast also uses frequency hopping spread spectrum (FHSS) technology in which the transmitter constantly and automatically searches for open channels in the 2.4GHz band, jumping to them to avoid interference with other products such as telephones, radio controlled toys, cell phones, and wireless routers. This avoids any ‘hissing’ interference that you might expect from lower end wireless outdoor speakers. The Verdict? 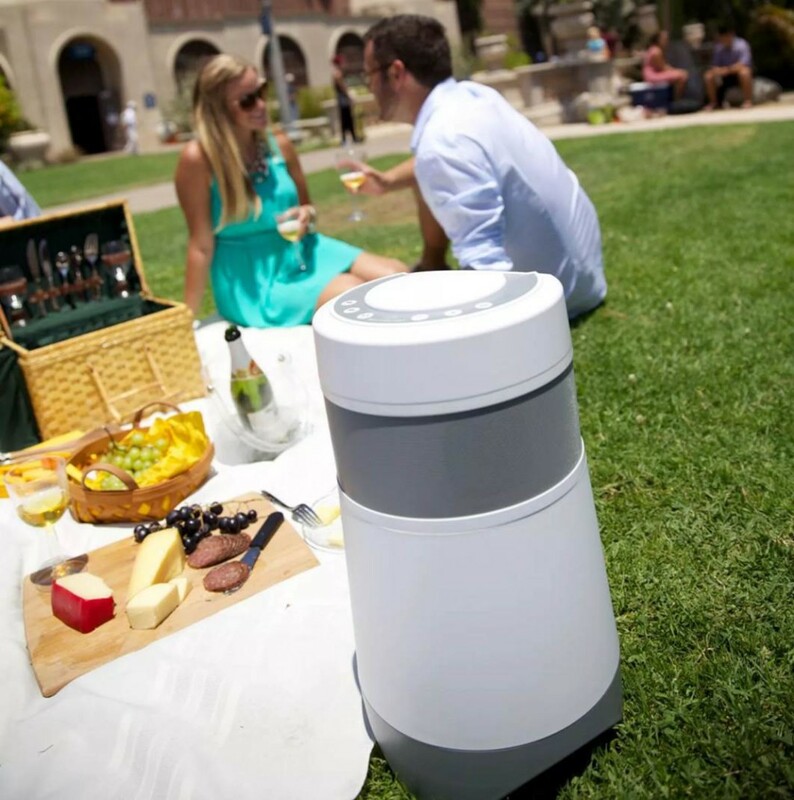 We highly recommend the Soundcast wireless outdoor speaker. The system wireless range and battery life is outstanding, and the sound from these speakers is by far the best we have ever heard. If you are looking for a simple way to add music to an outdoor living space, this is probably one of the best choices in the market. Although the price on these speakers may be more expensive than the rest of the speakers in this list, we are convinced that you will not be disappointed especially if you are looking for great audio performance from a convenient and portable speaker. The OSD Audio BTP-525WHTs are one of the best wireless outdoor speakers that money can buy. The all-weather design makes this speaker water resistant and resistant to the outdoor elements in general; its solid reinforced construction and metallic wire-mesh provide good protection to the audio equipment. It’s also a speaker that can be easily mounted on a wall bracket and is therefore ideal for patios, decks and pool areas. The construction and look of these speakers is also modern and smooth, making them very compatible with most home interior designs. Furthermore, these speakers come with brackets (not shown in the image) which were perfect for mounting. In terms of sound performance, these speakers deliver punchy and incredibly full sound. We were surprised at how deep the bass could go with these especially on a bluetooth connection. The volume of the speakers is sufficient for outdoor purposes and the bluetooth range is excellent. We found that the bluetooth pairing with our iphone and Android device was super quick and easy. The volume and bass output is pretty great considering that these are wireless outdoor speakers, and had no distortion whatsoever at maximum volumes. We are happy to note that the package includes a 30ft speaker wire and a stereo power amplifier found in the main speaker. If you intend to use these speakers outdoors, you can run the cable through a ½ in PVC pipe to hide it. The only complaint we had while testing it is that the power button is in an odd location – after mounting these speakers, we doubt that anyone would be able to turn off the speakers via the switch provided and you may need to unplug the speakers after use. Having said that, we really liked how well these speakers functioned in the outdoors and audio superb audio performance to our ears. The Verdict? 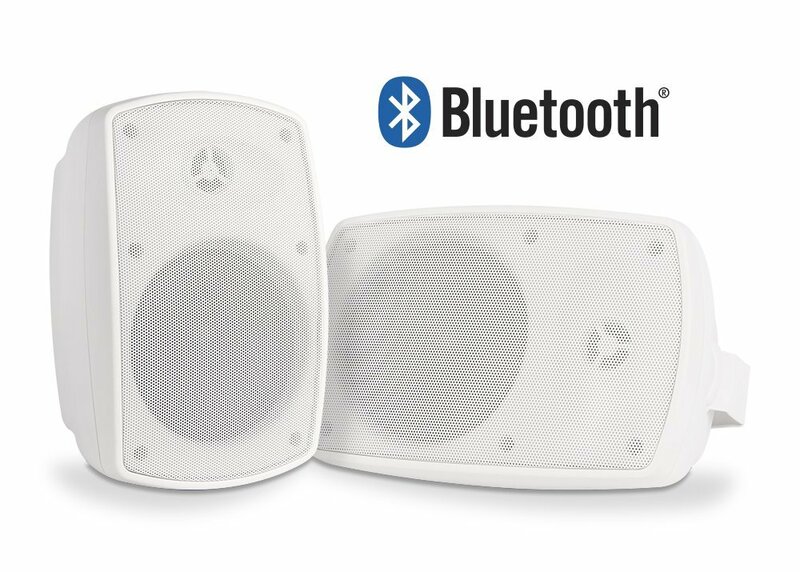 Overall, the BTP-525WHTs are very sleek and modern wireless outdoor speakers that are perfect for the outdoors, and can be mounted easily at the patio, decks and pool areas, although we recommend mounting these under sheltered areas to avoid direct exposure. The all-weather material construction makes these one of the most versatile outdoor wireless speakers that deliver solid bluetooth functionality and great audio performance even in outdoor conditions. They are some of the best wireless outdoor speakers you can find that are highly value for money – we would say that the BTP-525WHT is great bargain for what you pay for. The Pyle ‘PDWR’ is a pair of very good outdoor wireless speakers with incredible audio performance, providing high-powered wireless bluetooth performance outdoors. We were very impressed at how good these speakers sounded considering they are not connected to a separate amplifier. 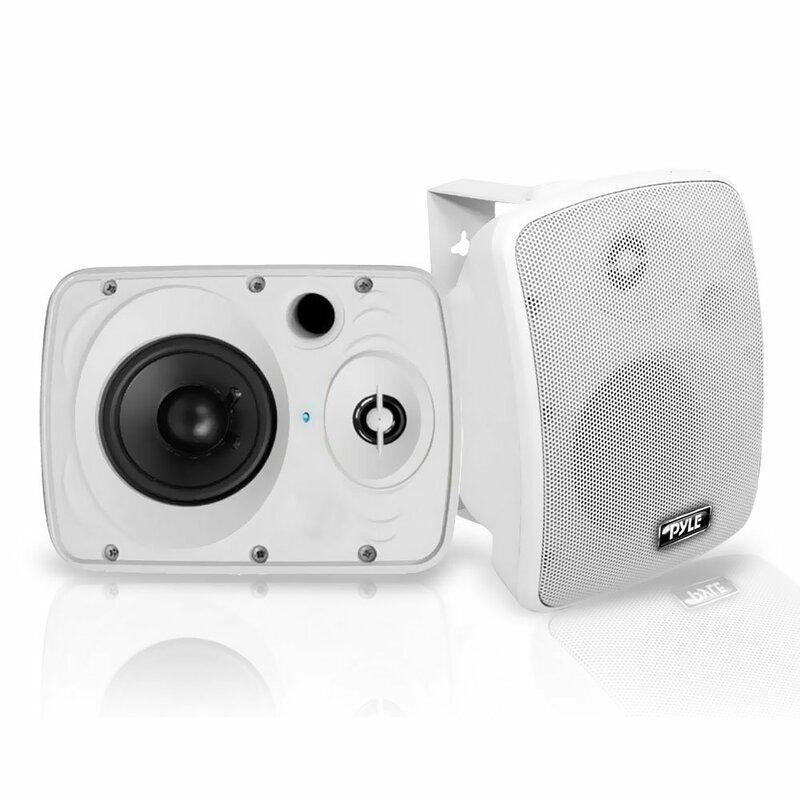 The good thing about these outdoor speakers is that they feature marine grade waterproof housing performance, and they are the perfect choice for adding full range stereos on decks, patios or backyards. It also easily syncs with android, iPhone or Samsung Gear watch which makes managing your soundtracks nice and clean. What we really liked about these speakers is that they are solidly constructed to withstand the outdoor elements and yet are able to be powered wirelessly. The system itself includes (2) wireless outdoor speakers – one active and one passive, with built-in 2-channel amplifier that gives you the ability to daisy-chain and create sharp stereo sounds with polymer dome tweeters and long-throw subwoofers for each bass. This is especially helpful if you like to watch movies outdoors – the thrill of having sound come from so many different locations is just amazing to listen to (try watching Jurassic Park on these wireless outdoor speakers and listen to the dinosaur charging at you from behind). The sound on these speakers can go really loud with punchy bass due to the 5.25” woofers which provide full range sound. We did not detect any distortion at maximum volumes. The active and passive speaker system work together to create nice soundstage which was quite rare for outdoor speakers of this size; we found that it produces rich and full sound that has a certain depth and quality to it. Furthermore, we found that the bluetooth connection stays connected from quite a distance. The built-in bluetooth audio streaming ability allows you to connect and stream audio from most devices (which includes iPad, Tablet, Computer or any other bluetooth device with playback). You can also choose to connect your speaker system with rear located gold-plated speaker plug terminals and RCA audio input connector jacks. The only down side we found with these is that the cord connecting the two speakers is shorter than one would expect. The Verdict? The Pyle ‘PDWR’ is a truly a rare find at this price range and is highly value for money. It is one of the best performing wireless outdoor speakers you can find with a dedicated in built active-passive sound system. The audio performance from these speakers are truly spectacular, and also feature marine grade waterproof construction for outdoor use. They are also very convenient to install /mount and are perfect for patios or pool or deck applications. 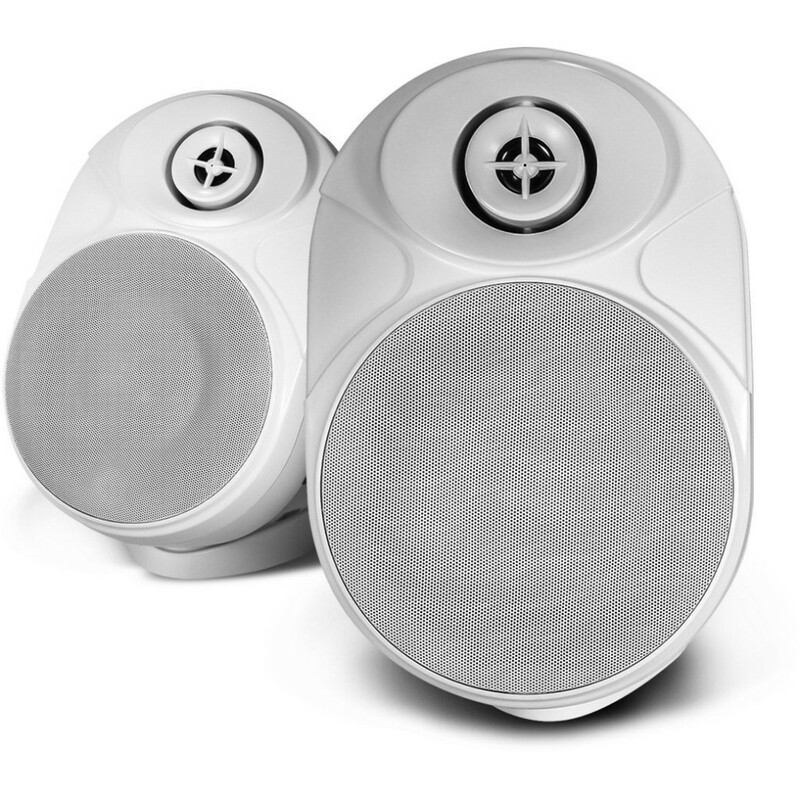 We were very impressed with the NXG Technology wireless outdoor speakers. When we first reviewed these speakers, we immediately noticed how durable and well-constructed these outdoor speakers were. The stand/mount is well built with smooth adjustment of the pivot point. The control panel on the main speaker is nicely labelled and contains quality switches, potentiometers, and auxiliary input jacks. The covers fit snugly and should protect the speakers well. It is apparent that these speakers are put together with above average materials. None of this would matter though, if the sound quality was sub-standard. When we powered up the speakers for the first time and tried pairing them with a Kindle Fire, a clear woman’s voice announced: “Your device is now connected”, which we have to admit was kind of cool. We tested these wireless outdoor speakers with a few classic soundtracks. The sound quality of Fleetwood Mac’s “Go your own way” was fantastic. The bass could be adjusted from very little to thumping. The treble was also easy to adjust to my preference. We tried mounting these speakers under the eaves of the house on each end of my deck. Bottom line: we am amazed at the sound quality of these speakers. From quiet, classical music movements, to cool jazz, to 70’s rock, these speakers are excellent. There is no hum in between selections, and no static crackle or pop at any time. We were initially sceptical that these speakers could perform well for the price, but we were so wrong. The NXG Technology speakers are testament to the fact that you can get high quality audio outdoors at very affordable prices. We also liked the additional features that came with these wireless outdoor speakers. The PVC enclosure was very sturdy with plastic bracket and metal “rotating ball” style mounts. It also provides good shielding – the hefty weight could indicate large magnet size; we had zero hum from stock power-cord testing. It also has a built in amplifier, meaning the round “dog-bone” style power cord is needed to connect these speakers. There are no proprietary cables, and the generic power cable can be easily replaced – you can use generic speaker wire to connect a passive second speaker. The Verdict? This 55 watts RMS wireless outdoor speakers pump out some great audio juice with their 6” polypropylene woofer and dedicated amplifier with 2-band equalizer. It’s one of the best wireless outdoor speakers at this amazing price range, featuring solid all-weather construction and great bluetooth connectivity and great audio performance. These speakers look great and modern too – and will definitely enhance your outdoor listening experience by miles. These amazing speakers are a mark above the rest in terms of sound performance, so be sure to check them out! 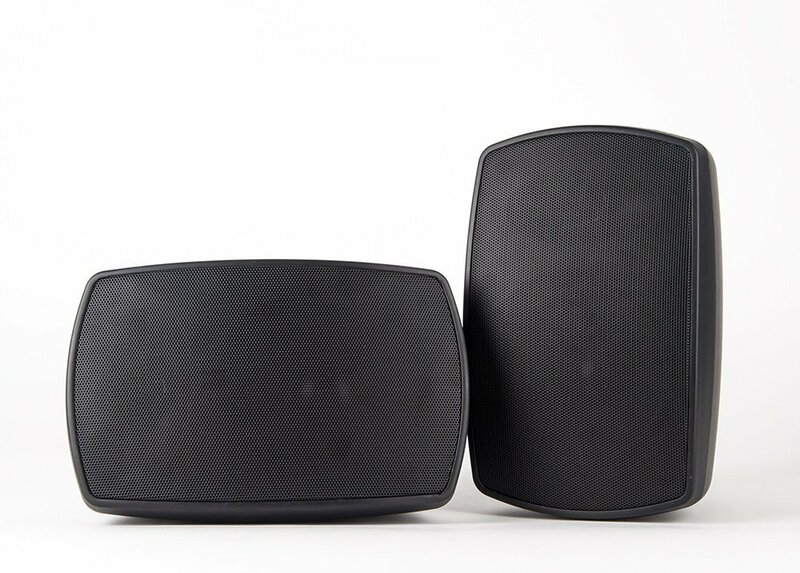 The OSD Audio BTP-525BLK wireless outdoor speakers are individually designed and fitted with an all-weather construction and “start of the art” bluetooth operation which allows for maximum connectivity. If you need outdoor audio speakers, the OSD Audio BTP-525BLK will provide a simple and quick fix. Installation of these speakers were streamlined to be very simple; it’s ideal for patios, decks and pool areas, but can also be used for indoor applications such as home entertainment or music for your store or gym. The bluetooth connection on these speakers worked seamlessly to provide connection to virtually any bluetooth enabled device – we tested this one the iPhone, Android, Samsung Galaxy, ipad and laptop with surprisingly no issues at all. The package also includes an AC Power 110-240V Transformer 8ft power cord to main patio speaker power connection for the bluetooth receiver and stereo power amplifier in the OSD Audio wireless outdoor speakers. It also comes with a 30ft speaker wire which came very handy for installation. The sound of the OSD wireless outdoor speaker was incredible, with a total of 75 watt per individual speaker at an impedance of 8 ohms. The sound was crisp and clear, which great emphasis on the highs and mids. We found that the bass was punchy and not overpowering, although somewhat lacking in outdoor spaces (although this is to be expected). We recommend installing these wireless outdoor speakers near corners to accentuate the bass response on these. However, as individual speakers, they pack seriously a lot of power and can play at loud volumes (loud enough to disturb your neighbours for sure) without distortion. The size of these speakers was average as compared to the other speakers at 7” by 9” by 6”. The Verdict? The OSD Audio BTP-525BLK wireless outdoor speaker offers a ready solution to those looking to install outdoor audio at their patio, pool or deck areas. They are not the portable type of speakers you can take out to the beach or camping site, but having said that, their material construction and weather-proofing is far superior to these portable outdoor speakers. The sound output of these speakers are incredible (at 75 Watts per speaker) which is really more than what you would need in most circumstances. Overall, these speakers are value for money and represent a good long-term investment. 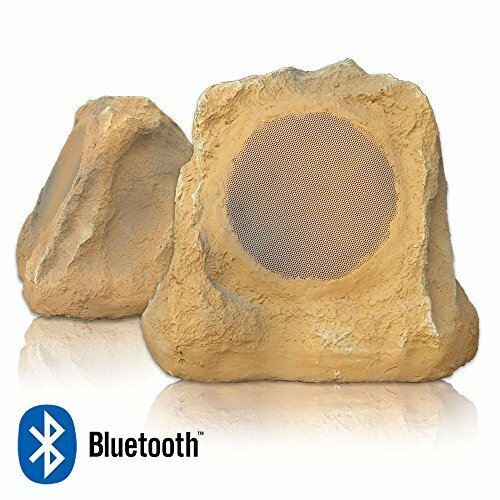 For those who are looking for wireless outdoor speakers to fit into their garden, these rock speakers by Sound Appeal are the perfect solution. With these speakers you can wirelessly steam music up to 100ft directly from your iphone or any bluetooth device. Furthermore, the sound quality of these speakers are simply unbeatable – you will be able to fill your backyard or pool area with high fidelity sound all while controlling the volume or soundtracks at your fingertips. Furthermore, these wireless outdoor speakers are built like a tank and are designed to withstand extreme cold and heat without failure or reduced life. The multilayer cabinets are built to withstand hot or cold temperatures; the inert design of these cabinets allow them to keep their shape even after constant exposure to the elements. To top it off, the Canyon Sandstone finish is natural and will blend perfectly into the current landscaping. These wireless outdoor speakers produce very good sound – the sound is clear, rich and powerful, and fills up the backyard easily. The low-end bass is respectable, and the mids and highs are superb. The fidelity is quite nice, and the sound does not sound overdriven at the highest volume level (no distortions either). We note that the 6.5” woofer driver can pump out strong deep bass while maintaining a high level of fidelity; the 1” dome tweeter keeps the highs smooth with no hint of harshness, and the voice remains clear and articulate. The internal amplifier is a high efficiency class D design with 60W RMS of output power, which is great for medium to large sized pool areas too. The Bluetooth works very well. The range we tested was about 30 to 40 feet and the sound did not have a hint of breaking up. In fact, the speaker sounds just as good as any wired outdoor speaker would – maybe even better. Furthermore, these speakers look awesome and blend in perfectly well into the garden foliage just like any other rock. These speakers were truly a spectacular addition to our garden and impressed the guests at dinner who wondered where the music was coming from. The Verdict? We highly recommend these wireless outdoor speakers – not only are they the perfect garden speakers (blending in very well with the surrounding landscape), they sound incredible and work perfectly with any bluetooth device. We were impressed at their quality construction which are designed to withstand the outdoor elements. These speakers are worthy every single penny of investment if you are looking for a long-term outdoor option. The Sound Appeal 6.5” wireless outdoor speakers are a pair of incredibly good weatherproof speakers. They are portable and easily mountable, making them the ideal wireless solution for pool speakers, patio and deck speakers, outdoor living and outdoor home theatre speakers. They work very well with the Galaxy S5, the iPhone 5, and the B&N Nook thanks to the long range advanced Bluetooth technology by Sound Appeal. We found that with these BT Blast speakers we could wirelessly steam music up to 100ft directly from your iphone or compatible Bluetooth device. You will be to able to fill your backyard or pool area with high quality sound while controlling the volume and soundtracks with your Bluetooth device. We also managed to connect multiple devices as much as 15 feet from the speakers and have no problems with static on Bluetooth connectivity issues. We note that the weatherproof cabinet has a beautiful white finish and is made of durable ABS material, which reduces any interference from outdoor elements. The internal cabinet walls are thick with rigid bracing to prevent unwanted cabinet resonances, allowing for clean clear sound at all levels. The sound from these speakers was nothing short of amazing – we found that the 6.5” woofer driver can pump out strong deep bass while maintaining a high level of fidelity. The 1” dome tweeter keeps the highs smooth with no hint of harshness, and voicing remains clear and articulate. The amplifiers on each speaker pumps out a good solid 60Ws of power – the volume can go very high with these wireless outdoor speakers without any distortion. The electrical cord we received together with these speakers read “for outdoor use” which was a convenient addition to the overall package. However, we felt that the fairly large transformer in the middle of the electrical cord was a bit of a hassle – we used an extension cord and ‘hid’ the supplied electrical cord with the transfer above the main speaker. Fortunately, these speakers came with brackets which made installing them on the patio and deck area quite easy. The material construction on these speakers was excellent and can withstand extreme cold and heat without failure or reduced life – they look pretty awesome and have a clean finish. The Verdict? 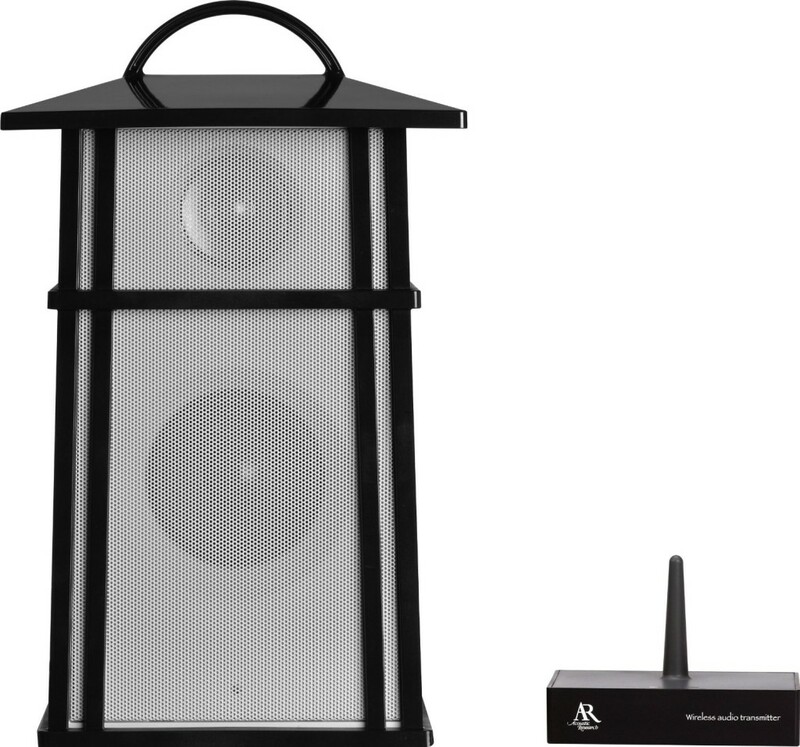 We were extremely satisfied with these wireless outdoor speakers and their sound. You can play with the sound settings on the Bluetooth devices to get the best sound. The volume is good and the sound is rich and full, although perhaps somewhat lacking in the bass department. The mids and highs sound really good though, and we really liked the 60W amplifier that was capable of filling our deck and patio areas with great music through the day. They come highly recommended at the time of writing so don’t hesitate to check them out! The iFinity is one of the most powerful wireless outdoor speakers, running at 80 watts RMS power with superb bluetooth connectivity of over 600 feet. After unpacking the speaker, we were surprised by how massive this speaker is – it’s fairly heavy due to its thick enclosure.The speaker itself is shaped like a cube and has some controls at the rear that allow it to be paired with the transmitter. It is a 2-way speaker and has two efficient ultra-low-distortion power amplifiers built in. One amplifier drives the speaker’s subwoofer, and the other amplifier drives the high-frequency tweeter. The bundle includes one wireless speaker and one iFinity transmitter. The setup of the transmitter and the wireless outdoor speakers was fairly quick. We plugged in the power to both units and then paired the speakers with the transmitter which takes less than 10 seconds. We recommend pairing the speakers with the transmitter while it is in close proximity – you have about 1 minute to pair everything up. It is important to set up the volume control of the transmitter unit properly; although this is a one-time setup. The speaker volume can be controlled at the speaker itself and you can also use the remote control of the satellite receiver to control the volume and change channels. A special feature of the transmitter is that, unlike bluetooth, the music is set uncompressed at full CD quality to up to four wireless outdoor speakers. This gives ample opportunity for sound-staging and audio positioning in outdoor spaces. The sound quality of this wireless outdoor speaker is very good. It has good bass and crisp treble which is quite impressive for a speaker of this size. The treble is adjustable. We turned the volume up around half way and found that the outdoor speaker really pumps out some hefty volume without any distortions at high volumes. The transmitter range is also quite impressive. We tested the transmitter around 100 feet away from where the speaker is at. There are 2 walls between the speaker and the transmitter. However, the speaker thus far has had great wireless reception – no hissing or crackles. We were pleased to note that the wireless signal is highly resistant to wireless interference from other devices and it uses advanced adaptive frequency hopping and error correction to preserve the quality of the signal. The Verdict? We were very pleased with the performance of the iFinity wireless outdoor speakers. It has very good sound quality and a lot of power (a solid 80 Watts) output, with a wireless range that surprises most wireless speakers beyond 600 feet. The solidly constructed speakers also makes them water resistant, which is great for bringing it outdoors and recreational activities. If you are looking for one of the best wireless outdoor speakers that is technically strong at all levels, this is the speaker you should consider getting. The Grace Digital Mini-Bullet II are a set of very good wireless outdoor speakers with water resistance and decent sound at this price range. The two wireless auto-tune stereo speakers feature automatic level control, as well as Double Bass Boost (DBB) on each speaker for a richer and fuller range sound. A single color mood light adds ambience to night time outdoor listening, which we felt was a nice added touch. An LED power indicator on the transmitter and speakers and an LED auto-tune indicator on each speaker constantly reports the system status. These speakers had all the functionality expected in wireless outdoor speakers well thought out and designed. These Mini-Bullet speakers look very modern and sleek, and came nicely packaged in sturdy boxes. There were 3 AC power adaptors included for the transmitter and the two speakers, in case you want to forgo the wireless function. The setup was easy; we found that you can use the auto-tune button to find good reception with no hissing noise. The great thing about these speakers is that you can link them up with up to 10 accessory speakers in the network (i.e., more Grace Mini-Bullet IIs) to expand your outdoor network, which was a pretty neat function. 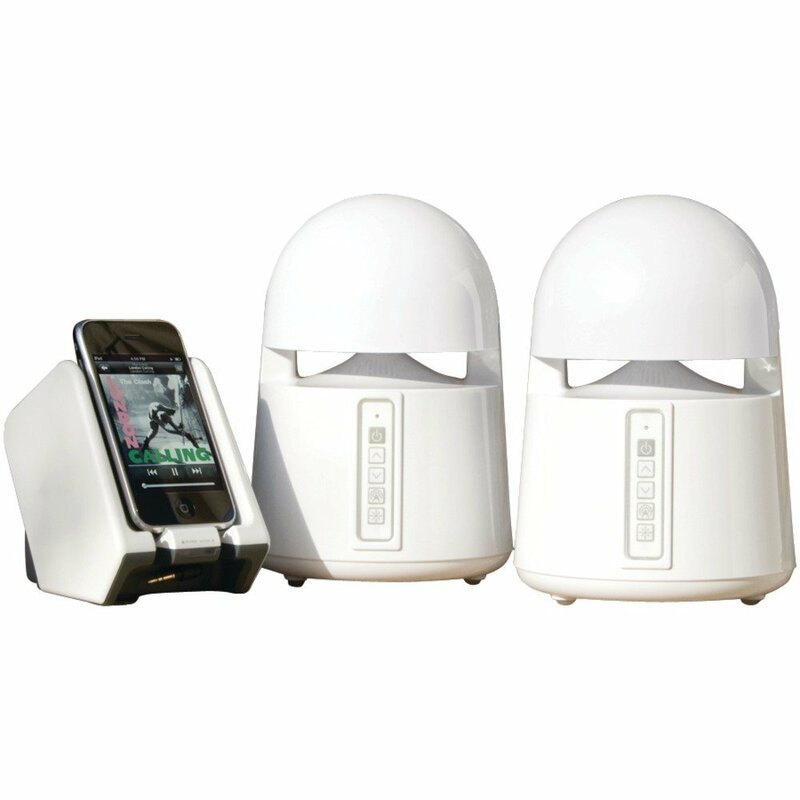 We particularly liked the 900 MHz wireless technology that provided approximately 150 feet range for these speakers, which means that you can easily hook up your iPod or TV and listen to them in your yard or patio. In terms of audio performance, we found the sound quality to be crisp and clear, and it also had the ability to connect to FM radio. The sound is not the sort of audiophile sound you would expect, but it comes across clearly for a good outdoor time. The speaker can go very loud at maximum volume and there were no distortions to the music. The Double Bass Boost function worked pretty well too, and we could hear some of the punchy beats come to live with these speakers, although nothing that will blow your mind. If you are using these speakers for camping or on the beach, you can also switch on the mood lights in the evening for good ambiance. We found that these wireless outdoor speakers are very light to carry around, but heavy enough not to be blown over by wind. The battery life on these speakers last a good 7 hours too, which packs plenty of juice for the outdoors. The Verdict? The Grace Digital Bullet II are a pair of sleek and modern wireless outdoor speakers you can find at a very good price that are very portable, easy to set up and sound good. For speakers at this price range they represent incredible value for money. The additional functions that come with it, such as multi-linking and mood lights are a nice added touch. The water-resistance on these speakers are essential for the outdoors too, and make them overall a highly versatile pair. The Monster BTW249 is one of the best wireless outdoor speakers in the market and is an easily mountable speaker that can be used indoors and outdoors. The speakers are an improved version of the predecessor Monster speakers and are now equipped with EZ-Play Technology and are water/moisture resistant, which allows it to be used outdoors as a portable speaker option. The great thing about this speaker is that it boasts 40 watts of explosive power and looks good with an intense grill. The weather resistant design allows you to take your speakers to the late or beach to provide excellent audio without the hassle of cables and wires. This means that all in all, this is one of the very few wireless outdoor speakers that have lots of power for solid, full solid, are water resistant and can be wall mounted and are bluetooth and you can even pair eight of these together to play simultaneously. In terms of functionality, these wireless outdoor speakers are hands down one of the best and they are a rare combination in outdoor speakers. The battery life on these wireless outdoor spears last a good 8 hours. The sound produced is full, loud and deep. The highs and lows are crisps and clear, and the bass sounded punchy and very much like bass you would expect from high quality speakers. To connect to your handheld device, all you have to do is hold the phone over the top of them for a second, and the speakers will do the rest. There are also holes in the back for mounting and the speakers sync easily together. At 40 watts, you can really crank up the volume without sacrificing quality or hear any distortion. We were blown away with the quality of the sound and the volume these things are capable of. These wireless outdoor speakers come with 2 full range drivers and a “bass compartment”. 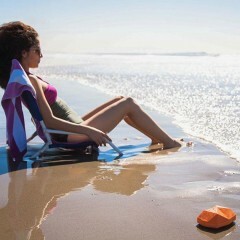 We tested these on the beach and found that the inclusion of separate volume controls on each speaker is very convenient. They are also excellent out on the pool deck in the back yard. Furthermore, the bluetooth with NFC connectivity allows the pairing of up to 8 of these speakers (with additional Monster BTW249s) 40 watt wireless outdoor speakers. This means that you can literally distribute these speakers around your backyard or outdoor space to create an excellent soundstage. The Verdict? The Monster BTW249 wireless outdoor speakers are a steal and definitely speakers worth checking out. They are a rare find because they combine all elements of portability, water resistance, connectivity and great sound all into one single package that’s easy to set up and use. If you are looking for excellent wireless outdoor speakers that can pair up and sync together, these outdoor speakers are hard to beat.